General Information: This section contains general information used by all contract expirations in the particular profile. 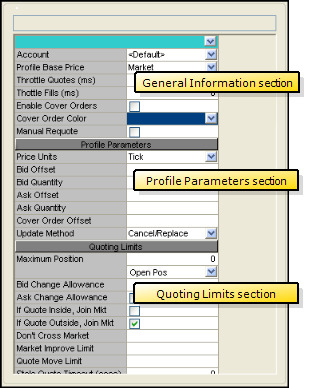 Profile Parameters Section: This section contains specific trading parameters for the profile. Parameters include prices, quantities, market offsets, and cover order information for the Bid and Ask. Quoting Limits Section: This section configures the behavior of Autotrader in response to market conditions. In addition, it sets your position and market improve limits. Use the General Information section to configure the parameters listed below. Displays all customer accounts you set up in X_TRADER. Note: changes made to displayed account profiles automatically update the grid. Direct Order Entry: Uses the prices set in an external application that you must link to Autotrader. You must paste prices directly into the scratch pad. Market Price: Uses the best bid or offer. Single Theo: Uses a single theoretical price you define in the TheoSingle column of the Theo Prices section. Relies on offsets to specify bid and ask. Bid/Ask Theo: Uses the theoretical bid and theoretical ask prices you define in the TheoBid and TheoAsk columns of the Theo Prices section. Note: Refer to Linking Theoreticals to Autotrader, and Theo Prices Section for more information. Regulates the frequency (in milliseconds) at which Autotrader sends quotes to the market. Regulating this frequency helps you avoid exchange fees for quoting excessively. If this field is zero (0), Autotrader updates its quotes whenever Profile Base Price changes. Note: If you are the market, Autotrader does not change your order. Regulates the frequency (in milliseconds) at which you throttle between fills to give your spreadsheet time to update the position. Regulating this frequency, helps prevent you from regularly getting double filled on the second leg of a spread if you use both Autotrader and Excel to spread. This feature is better than throttling between orders because you can continue to work the second leg of a spread. Configures Autotrader to cover your orders. When an order is completely or partially filled on one side of the market, Autotrader submits a covering order on the opposite side of the market. Example: If a bid gets filled, Autotrader submits an offer. Use the Cover Order Offset box in the Profile Parameters Section to offset your cover orders from the fill price. Sets the color Autotrader uses to designate cover orders it submits to the market. Allows you to control the number of fills Autotrader completes. This feature stops fills after an initial fill. Therefore, Autotrader does not continue to fill orders that you either do not want or do not even know about. You must click Update Orders to requote. You use the Profile Parameters section to define your trading parameters. Autotrader uses these parameters to determine how it behaves when submitting and removing quotes to and from the market. Note: You can Using Formulas in any numeric cell (i.e., Offsets and Quantities) to create dynamic values. Sets the number of price units away from the selected Profile Base Price at which Autotrader bids. When the market moves, Autotrader adjusts your order by the offset. You set how frequently orders are sent using the Throttle Quoting feature in the General Information section. Note: For all offsets, a positive number sets Autotrader to submit the order away from the Profile Base Price. A negative number sets Autotrader to submit the order inside the Profile Base Price. Sets the default bid quantity Autotrader uses when bidding. The same as Bid Offset above except it affects the Ask not the Bid. The same as Bid Quantity above except it affects the Ask not the Bid. For a filled bid, Autotrader submits the covering order above the fill price with the appropriate offset. For a filled offer, Autotrader submits the covering order below the fill price with the appropriate offset. Use Cancel/Replace: Autotrader deletes your quote order and sends a new order to the market. Use Cancel/Replace partial fill quantity: Autotrader deletes your quote order and sends a new order to the market with the remaining quantity of your order instead of the original quantity. Example: You have an order for a Qty of 20. You get filled on a Qty of 15. Instead of replacing the original Qty 20, a new order is sent with a working Qty of 5. Use Change: Autotrader sends a change request to the exchanges that accept them. Changes are counted as one transaction instead of two. This section configures how Autotrader responds to market conditions. In addition, it sets the threshold for your maximum position warning. Note: You can Using Formulas in any numeric cell (i.e., Maximum Position, Change Allowances, and Market Improve Limit) to create dynamic values. Sets the maximum open position (used for both long and short) you can reach before Autotrader stops quoting the position-increasing side of the market. When you reach this maximum position, Autotrader notifies you via the Quote Exceeds Maximum Position window but continues to quote the position-reducing side of the market. Open Position: Position for each contract for each account. Row Position: Position for the orders traded using the Autotrader strategy in that row. Note: Your Max. Position Limit does not supersede risk parameters set up by your risk administrator. Sets the minimum amount of change from the Base Profile Price the best market bid must move before Autotrader adjusts its quotes. Sets the minimum amount of change from the Base Profile Price the best market offer must move before Autotrader adjusts its quotes. Adjusts any order inside the current market to match the current market price. Use this check box in tandem with a theoretical pricing or direct order entry model. Adjusts any order outside the current market to match the current market price. Rejects any order if it crosses the market. Default is off. Note: Cross order checks occur when Autotrader quotes automatically. Sets the limit of price units by which a quote can improve the market. 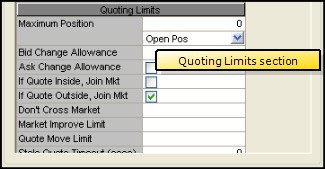 If an order attempts to improve the market more than the set limit, Autotrader adjusts the order so it remains within the set limit. Use this parameter in tandem with a theoretical pricing or direct order entry model. Sets how far the quote moves and changes. If the new quote exceeds the Quote Move Limit, Autotrader does not send it to market and a warning message appears. Enabling this field is recommended if you use your own theoretical formulas and spreadsheet. Note: Quote Limit checks only occur when Autotrader quotes automatically. Checks the effectiveness of your theoretical pricing spreadsheet. If your quote does not move in the seconds you set, Autotrader notifies you to check your spreadsheet. Note: Autotrader deletes the outdated quotes.